Although he had no interest in understanding or treating colours in the same way as artists, it is unlikely that any other chemist has influenced the development of art as much as the Frenchman Michel Eugène Chevreul (1786-1889). Chevreul trained as a chemist, and in 1824 was appointed as director of Gobelin, the famous carpet manufacturer. Here, he concentrated on the problems of dyeing, and therefore on the dyes themselves. As a chemist, Chevreul supervised the preparation of these dyes, and it occurred to him that the main problems had nothing to do with chemistry but were more related to optics. A colour frequently failed to achieve the desired effect. This was not caused by pigments, but by the influence of neighbouring colour tones. 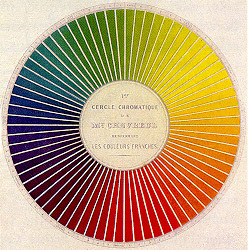 Chevreul decided to investigate the matter on a scientific basis, and in 1839 published his «De la loi du contrast simultané des couleurs» (historical illustration), a comprehensive attempt at providing a systematic basis to seeing colours. The work dealt with the so-called «simultaneous contrast» of colours, and contained Chevreul’s famous law: «Two adjacent colours, when seen by the eye, will appear as dissimilar as possible». Chevreul’s work influenced the movements in art known as Impressionism, Neoimpressionism and Orphic Cubism, with Robert Delaunay (1885-1941) using coloured «simultaneous discs» in his paintings. Although Chevreul’s work remained impractical and was never completed, he also influenced the views of both Eugène Delacroix (1798-1863) and Georges Seurat (1859-1891) with regard to colours and the way in which they used them. Leonardo da Vinci had probably been the first to notice that, when observed adjacently, colours will influence each other. Goethe, however, was the first to specifically draw attention to these associated contrasts and described them with such emphasis that they have continued to be born in mind. Whoever should simultaneously look at the same red, first on a yellow background and then on a violet background, will have two different impressions: in the first case a darker red; in the second case, a more orange red. Chevreul was able to establish a difference between the two ways in which simultaneous contrast occurred and spoke of changes in intensity as well as «optical composition». Nowadays, we know with greater accuracy that there are three components which can displace one another under the influence of surroundings of another colour. These three components correspond to the dimensions of a spacial colour system and are named brightness (or value), hue and saturation (or chroma). One and the same colour will have a brighter effect against a dark background, and a darker effect against a light background: a pure red will have a redder effect on a yellow background, and a yellower effect on a reddish background; a grey red will have a more colourful effect (less grey) on a grey background than on a coloured background. This simultaneous interaction of colours can be easily understood or interpreted using the colour-circle or the colour-sphere if we accept that the background colour will repel the colour of the observed colour field. Of course, our perception must actually carry this out, and since it is therefore reasonable to assume that our eyes and brain will try to perceive the differences occurring in nature as clearly as possible, this explanation conforms with the displacement represented by the colour-circle. This is the first time that we have been confronted with the active role of the brain in the formation of colours, and we should once more remind ourselves that colours are also effects which are created in the world inside our heads — this can be better envisaged by consulting the contributions of physiology. Let us return to Chevreul, who in his 1839 work demonstrates that a colour will lend its adjacent colour a complementary tinge (of colour hue). As a result, opposing complementary colours will brighten, and non-complementary colours will appear «contaminated», for example a yellow next to a green receives a violet tinge. The laws of colour contrast occupied Chevreul during his search for an adequate organisation of colours, as required for the manufacture of textiles. For this purpose, he designed the 72 segment colour circle shown here. The circle defines the colour hues on the basis of the various changes which a colour undergoes in the direction of white (higher intensity) or black (lower intensity). According to Chevreul, 10 steps are possible. 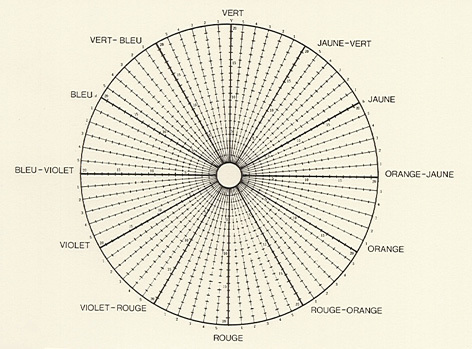 It is worth noting that in his colour-circle, Chevreul arranges each of the saturated colours on a varying radius within its associated segment. Pure yellow lies nearer to the centre than pure blue. Pure red lies at point 15 on the scale. By this means, the values of colour hue for the different pigments are given a position more appropriate than in preceding systems. In Chevreul’s colour-circle we find three secondary colours (the primary mixtures orange, green and violet) alongside the three subtractive primary colours (red, yellow and blue), as well as six secondary mixtures. The segments arising in this way are thus divided into six zones, and each radius is divided into 20 sections in the form of a ladder, in order to specify the different brightness levels. 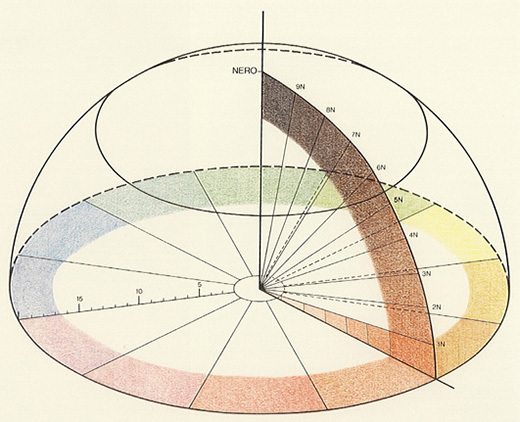 With his hemisphere, Chevreul attempted to provide us with a spacial representation of the colours appearing in his two dimensional colour-circle. 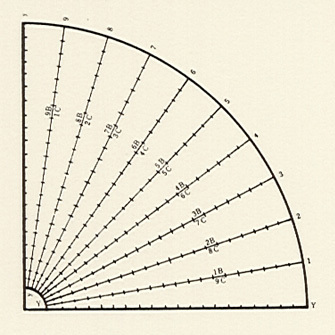 The black axis of the hemisphere thus becomes a pointer, pivoting to select the different levels on a scale. The numbering will then stipulate the proportions of a colour, for example 9B/1C will mean that 9/10 black and 1/10 of the corresponding (colour) hue are present. Chevreul was convinced that the many different colour hues and their harmony could be defined by means of the relationships between numbers, and he wished his colour-system to become a suitable instrument, available to all artists using coloured materials. Although his harmony systems, which he described as «Harmonie d’analogues» (harmony of analogy) and «Harmonie de constraste» (harmony of contrasts), were of great influence, he was unable to discover a law of colour harmony. It simply doesn’t exist. Date: The chemist Michel Eugène Chevreul introduced his (incomplete) attempt at producing a systematic approach to seeing colours in 1839. Application: Organisation of colours for the manufacture of textiles. Bibliography: M. E. Chevreul, «De la loi du contraste simultané des couleurs et de l’assortiment des object colorés», Paris 1839; A. Hope und M. Walsh, «The Color Compendium», New York 1990; John Gage, «Colour and Culture, Practice and Meaning from Antiquity to Abstraction», Thames and Hudson, 1993, pp. 173-176.